TESvideos Archives - Lee Jackson - Motivational Speaker and Presentation Coach in organisations business and education. P.S. You can buy Lee’s books here. Find revision tips and learn revision skills from motivational speaker Lee Jackson. It may seem like there’s no light at the end of the exam tunnel, but Lee has one key message to keep you focused: Keep on going. 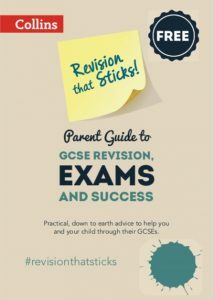 Find revision tips and learn revision skills from motivational speaker Lee Jackson. Learn how to maximise your chances of success right up until the day of the exam with these last minute pieces of advice. Find revision tips and learn revision skills from motivational speaker Lee Jackson. As the exams loom larger, discover top tips to make sure that you are at your best on exam day. Find revision tips and learn revision skills from motivational speaker Lee Jackson. One of the most difficult things to get to grips with during study leave is learning to revise. Lee has some top tips and strategies to make sure that you use your time effectively. Wow this is very challenging for the top brass in the Dept. For Education. …and now they want to scrap some subject teaching. How will that fit with OFSTED and the obsessive reporting and admin that causes so much stress for teachers? Radical stuff, could this help to kill the high turnover of English teachers and just let teachers teach? Finland schools: Subjects scrapped and replaced with ‘topics’ as country reforms its education system – Europe – World – The Independent. Only far eastern countries such as Singapore and China outperform the Nordic nation in the influential Programme for International Student Assessment (PISA) rankings. Politicians and education experts from around the world – including the UK – have made pilgrimages to Helsinki in the hope of identifying and replicating the secret of its success.Which makes it all the more remarkable that Finland is about to embark on one of the most radical education reform programmes ever undertaken by a nation state – scrapping traditional “teaching by subject” in favour of “teaching by topic”.“This is going to be a big change in education in Finland that we’re just beginning,” said Liisa Pohjolainen, who is in charge of youth and adult education in Helsinki – the capital city at the forefront of the reform programme.Pasi Silander, the city’s development manager, explained: “What we need now is a different kind of education to prepare people for working life.“Young people use quite advanced computers. In the past the banks had lots of bank clerks totting up figures but now that has totally changed.“We therefore have to make the changes in education that are necessary for industry and modern society.”Subject-specific lessons – an hour of history in the morning, an hour of geography in the afternoon – are already being phased out for 16-year-olds in the city’s upper schools. They are being replaced by what the Finns call “phenomenon” teaching – or teaching by topic. For instance, a teenager studying a vocational course might take “cafeteria services” lessons, which would include elements of maths, languages (to help serve foreign customers), writing skills and communication skills.More academic pupils would be taught cross-subject topics such as the European Union – which would merge elements of economics, history (of the countries involved), languages and geography. There are other changes too, not least to the traditional format that sees rows of pupils sitting passively in front of their teacher, listening to lessons or waiting to be questioned. Instead there will be a more collaborative approach, with pupils working in smaller groups to solve problems while improving their communication skills.Marjo Kyllonen, Helsinki’s education manager – who will be presenting her blueprint for change to the council at the end of this month, said: “It is not only Helsinki but the whole of Finland who will be embracing change.“We really need a rethinking of education and a redesigning of our system, so it prepares our children for the future with the skills that are needed for today and tomorrow.“There are schools that are teaching in the old fashioned way which was of benefit in the beginnings of the 1900s – but the needs are not the same and we need something fit for the 21st century.”The reforms reflect growing calls in the UK – not least from the Confederation of British Industry and Labour’s Shadow Education Secretary Tristram Hunt – for education to promote character, resilience and communication skills, rather than just pushing children through “exam factories”. But there would currently be little appetite in the UK for going as far as ditching traditional subjects. Even in Finland, the reforms have met objections from teachers and heads – many of whom have spent their lives focusing on a particular subject only to be told to change their approach.Ms Kyllonen has been advocating a “co-teaching” approach to lesson planning, with input from more than one subject specialist. Teachers who embrace this new system can receive a small top-up in salary.About 70 per cent of the city’s high school teachers have now been trained in adopting the new approach, according to Mr Silander.“We have really changed the mindset,” he said. “It is quite difficult to get teachers to start and take the first step… but teachers who have taken to the new approach say they can’t go back.”Early data shows that students are benefiting too. In the two years since the new teaching methods first began being introduced, pupil “outcomes” – they prefer that word to standards – have improved.Finnish schools are obliged to introduce a period of “phenomenon-based teaching” at least once a year. These projects can last several weeks. In Helsinki, they are pushing the reforms at a faster pace with schools encouraged to set aside two periods during the year for adopting the new approach. Ms Kyllonen’s blueprint, to be published later this month, envisages the reforms will be in place across all Finnish schools by 2020.Meanwhile, the pre-school sector is also embracing change through an innovative project, the Playful Learning Centre, which is engaged in discussions with the computer games industry about how it could help introduce a more “playful” learning approach to younger children.“We would like to make Finland the leading country in terms of playful solutions to children’s learning,” said Olavi Mentanen, director of the PLC project,The eyes of the education world will be upon Finland as it opts for change: will it be able to retain or improve its showing in the PISA league tables published by the Organisation for Economic Co-operation and Development.If it does, how will the rest of the education world react?Case study: Finnish approachIt is an English lesson, but there is a map of continental Europe on the whiteboard. The children must combine weather conditions with the different countries displayed on the board. For instance, today it is sunny in Finland and foggy in Denmark. This means the pupils combine the learning of English with geography.Welcome to Siltamaki primary school in Helsinki – a school with 240 seven- to 12-year-olds – which has embraced Finland’s new learning style. Its principal, Anne-Mari Jaatinen, explains the school’s philosophy: “We want the pupils to learn in a safe, happy, relaxed and inspired atmosphere.”We come across children playing chess in a corridor and a game being played whereby children rush around the corridors collecting information about different parts of Africa. Ms Jaatinen describes what is going on as “joyful learning”. She wants more collaboration and communication between pupils to allow them to develop their creative thinking skills. How to pass exams – Part 20 – Superman, Muhammad Ali and the air steward! How to pass exams – Part 20 Superman, Muhammad Ali and the air steward! I saw him in a Leeds bookshop a few years ago. He is probably the greatest sports star of all time and was known to be quick witted. Interviewers loved him as he bragged about being the greatest, or “the champ”. At the height of his career, he was on an aeroplane in First Class, with his people around him. Everyone was excited that Mohammed Ali was on the plane. The air steward was walking up the aisle checking that everyone had fastened their seat belts. She walked up and down the aisle, staring at everyone’s lap, double-checking the seat belts. “Superman doesn’t need a seat belt”. “Yes, Mr Ali, but Superman doesn’t need an aeroplane”! I wish I’d been there! She was super quick and left Muhammad Ali lost for words. Superman’s a fictional alien from another planet – a made up comic character – he doesn’t exist and Superwoman don’t exist either. 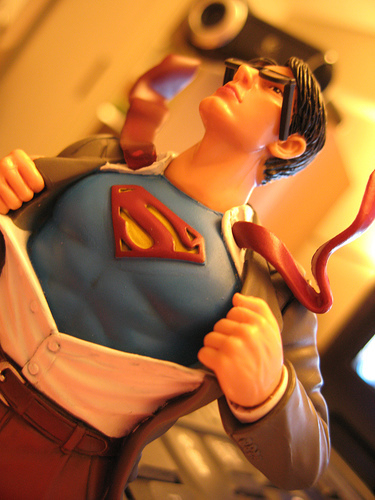 We don’t have super powers – we can’t do this school/college thing on our own. We must always take responsibility for our own success but we are also responsible for each other’s success too. Because we contribute to everyone else’s success, the way you act in school; the way you behave in lessons; the way you are with your mates; the way you encourage your mates instead of putting them down, makes a big difference. You and your mates are in this together. Do you remember the rescue of the miners in Chile? 33 men got stuck 2000 feet underground. It was 17 days before their families even knew they were still alive. Then hundreds of people worked, prayed and hoped they would get back to the surface and on the 13th October 2010 (69 days later) the first miner Florencio Alvalos came back to the surface to hug his wife and his son. It was truly amazing to watch. The world fixed its gaze on Chile as we saw every miner rescued safely. Florencio said he didn’t want to celebrate until all 33 of them were back safely. Probably the most amazing news story of recent years and it was filled with such hope, a real break from the doom and gloom of the normal news. They all made it because they all got involved and even the engineers and families on the surface were just as much part of the rescue as the miners were themselves. It’s like the whole of Chile contributed to their rescue. They made it out because they were a team. Hope kept them alive when many people said they wouldn’t make it. This an excerpt from Top UK motivational School Speaker Lee Jackson’s book “How To Enjoy And Succeed At School And College” Available in paperback and on Kindle (for only £1.99 during pre-exam time) here now. 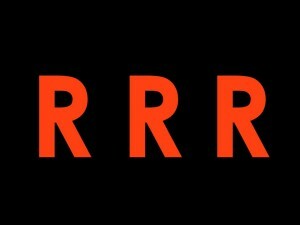 Before we come in to land, there’s just one more tip to help you, one more thing that you may not hear very often, it’s what I call the 3R’s. The 3R’s aren’t Reading, wRiting and aRithmetic, (spelt wrongly as they used to be in the 1950’s), but they stand for Relationships, Relationships and you’ve guessed it…Relationships. Life is basically a network of relationships. It doesn’t matter where you go, what you do, life is made up of relationships. If you go to a shop and see a t-shirt that you want in blue but they only have it in black, you have to ask someone. Life’s like Blackpool Rock… Kinda crunchy and bad for your teeth?! If you chop Blackpool Rock in the middle what does it say? If I chop it two thirds of the way through what does it say? If I chop it four fifths of the way through what does it say? Wherever you chop life and however you look at it, it will always be about ‘relationships’. There will always be a relationship that makes all the difference, ‘cos relationships are life, and if you put your relationships first, amazing things start to happen. I’ll give you a cast iron guarantee right here, right now. If you get on better with the people around you at school – you’ll do better in school. If you can get on better with the staff in school then I guarantee that you will do better in school. You will be more successful. But, hey, don’t panic. No-one’s perfect, you’re not perfect because I know I’m not perfect, but if you prioritise your relationships what happens is very powerful, everything else seems to fall into place. That’s how it’s meant to be, it’s how life works. If I am getting on better with my wife and daughters at home I have a better day/week/month. Relationships make a BIG, BIG difference to your life, in and out of school. Relationships do seem complicated but they’re not really. We don’t have to be an expert we just have to be honest, learn to say sorry and try to be a fun, reliable person. Two quick tips for your life at home, help around the house every now and again and tidy your room! Your life will be soooooo much quieter and enjoyable if you do these sorts of things. The best thing I learnt in my marriage was to wash up! Sorry to sound like a Dad – but I promise those tips will make your life much more fun. How to pass exams – Part 18 – Keep on going!! About a year earlier many people wanted to give up as it looked like Britain was losing the war, Winston Churchill’s guts was one of the reasons Britain made it through those tough years. Now is a bad time to give up on your education. Sometimes I meet people in Year 11 or 13 who look ok but really some of them have given up inside. After almost 14,000 hours of schooling some people seem to give up at the last hurdle. Sometimes just keeping on going is how you will be successful, it’s not magic, amazing or spectacular, it’s just about getting out of bed, going to school, putting one foot in front of the other and keeping on going. It’s obviously important to work smart and get our priorities right but for many of us it is just about putting one foot in front of the other. One of my favourite stories is the amazing resilience of a woman called Cha Sa-soon from Seoul in Korea. In November 2009 she passed her written driving test, nothing spectacular but she had taken it 950 times! That means that 949 times she paid her money and faced nothing but rejection and frustration. But on the 950th time she passed! She has not actually been in a car yet! Great advice from someone who has done well. My mum took 12 driving tests to pass. I’ve been in the car with her and that was about the right number! I wonder how many tests Cha Sa-soon will take? It’s just about keeping on going. The left hand side of the above diagram might be where you are now, your goal might be to go to university or start the career of your choice. 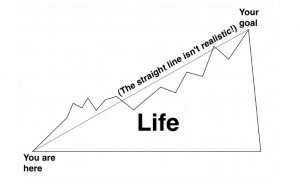 Some people will tell you that life travels easily in a happy straight line… but that’s not how it works. Sometimes we have a good day and a not so good day, a great week and a not so great week, a bit of dip here and there, but eventually you make it to your goal. Ultimately the difference between people who succeed at school and those who don’t is simply this, it’s what you do on your not so good days when things aren’t going quite so well that makes all the difference. Don’t give up. You can do it! How to pass exams – Part 17 – Join in the opportunity to serve and see your job prospects rise! Over the summer and in the holidays what are you going to do which isn’t all about you, but is about serving others too? Simon Glass is a former pupil of Allerton High School in Leeds and up and coming film-maker, but how did he get into it? Simon went to serve for free but it also helped him to get the next step on the ladder. He gave his time away and look how that helped him too! I don’t fully understand it, but it seems to work. This is me on a clean-up day – three or four times a year youth groups from around Leeds hire a few skips and go to the toughest parts of our city, we clean up a few streets and serve the area, it’s great messy fun. We don’t get anything for it, there’s no newspaper coverage, we just change a street for the day. 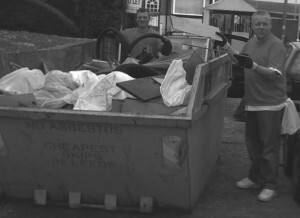 No-one talks to us at first but gradually people come out of their houses and talk to us, we put sofas in skips and pick up all sorts of unmentionable rubbish! Because I believe that serving people makes us better humans, and that helps us to be the best we can be. Who can you serve this week, in and out of school?